"Ramming Speed" redirects here. For other uses, see Ramming Speed Potion. The glorious and powerful curved horns of a ram strike across the sky as these firework charms explode. The Costumed Sheep Mouse is enamored by this display and will make an appearance when these erupt up above. The Ramming Speed Charm was only available during the Year of the Sheep Festival. It could be obtained by converting 1 Nitropop Charm using a Ramming Speed Potion and 768 Gold. Ramming Speed Potions were dropped by Lunar New Year event mice when Nitropop Charms were armed, but only during the Year of the Sheep Festival. 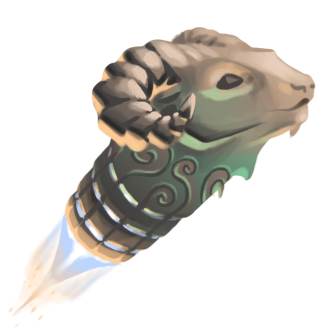 A Hunter's stock of Ramming Speed Potions can be converted to Ramming Speed Charms at any time, regardless of whether a Lunar New Year event is in progress. One Ramming Speed Potion converts 1 Nitropop Charm to 1 Ramming Speed Charm at 768 gold per piece. 17 February 2015: The Ramming Speed Charm was introduced at the start of the Year of the Sheep Festival. 26 January 2017: The Ramming Speed Charm gained 120 power and 1 luck. This page was last edited on 1 February 2017, at 22:30.